When people ask me what kind of music I like, I tend to wiggle my way out of answering the question. I won't lie - my music taste is deplorable. That said, I think we can agree that classic rock is definitely beyond my ken. Which is why when I went to the Paley Center last year to watch this Who docu, I wasn't really expecting to be overwhelmed. Nor was I really expecting Roger Daltrey to be there for the Q&A, either. But, what I forgot is that I tend to love band documentaries - all two that I've ever watched. Duran Duran's Sing Blue Silver and Metallica's Some Kind of Monster. But, Amazing Journey was fantastic. I learned so much about the Who - their beginnings, their music, their successes and failures, and in general, who these guys were. I seriously wanted to run out and get the DVD, without having listened to a full Who album ever. 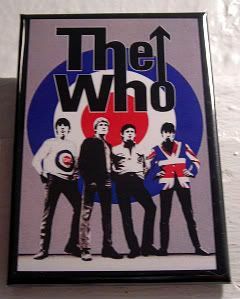 In fact, now I'm wondering how I didn't end up with The Who's greatest hits somewhere. Of course, on the way home, I had to call my mom to tell her who I just saw. And this is what several someones overheard on the corner of 52nd and 7th Avenue. Me: Mom! I just saw Roger Daltrey! Me: Yes. You know, Roger Daltrey!!! Mom: Isn't he that guy from that band you liked? Wham? Me: No! That's George Michael!!! Roger! Daltrey! You know, from The Who! Mom: Ohhhhhhh. I don't know them. LOL WHAM! Maybe you should've thrown in "you know, the CSI music!" Hahahaa - I will admit it here first. For a while, I didn't know that the CSI opening title song was from The Who. Even more embarrassing, I'll go one further. I didn't know they were singing, "Whoooooo are you." Heee. IIRC, didn't you think they were saying "blue" something? Hahahaaha - YES! I either thought it was Bluuuuuuue Water, or Coooooool Water. When I was five, I thought that the "let freedom ring" line in My Country Tis Of Thee was "lay vee da vee." And I was like, "Hmm, I wonder what THAT means?" My little sister is getting her PhD in ethnomusicology, which basically means she's the biggest music and culture snob there is, and there's no pleasing her unless the CD in my car is Tuvan throat singing or something equally as inaccessible to the layperson. So I've given up on trying to defend my choice in music, and I just own it now. Plus, it's always fun to see her cringe when I bust out something like, "OMG, have you heard the new Britney song? I just LOVE it." Hahahaah. My sisters are the opposite. They like to poke me with my love of Hootie.